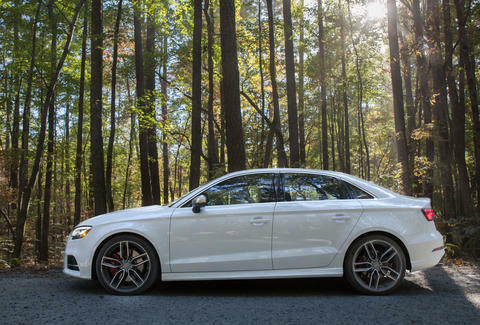 The Audi S3 has long been a perfect storm of style, luxury, performance, and tech. In short, it's an excellent car -- but it has been for a while now. It's high time for a makeover, and for 2017, Audi has delivered in spades. The new S3 takes "bang for your buck" to levels unprecedented by anything else in Audi's lineup. Not only does it boast sharper design cues taken from Audi's higher-end cars, it's snagged some seriously impressive tech as well, at price points $30k-$50k less than those pricier offerings. Add all that to the same formula that's made the S3 so successful for years, and the 2017 Audi S3 is one hell of a contender. 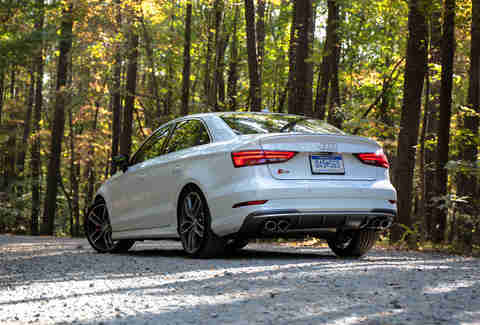 The S3 remains the sports king of Audi's small-car lineup, and its turbocharged four-cylinder engine makes a powerful statement; 292hp, to be exact, which means if you floor it right... now, it'll be going 60mph by the time you finish this sentence, or roughly four and a half seconds down the road. For those who want to save the forest instead of blasting through it at full throttle, might I instead suggest the all-electric A3 e-tron. Base price for the S3 starts at $42,900, but should you opt for the Prestige package with the optional glove-like sport front seats and Daytona gray paint, you'll land in the car's sweet spot. The damage: $51,375 (or so). The big standout feature here is the overabundance of new tech, which is finally trickling its way down from the top of Audi's lineup and into cars with price tags that don't require trigger warnings. The addition of Apple CarPlay and Android Auto is very welcome, as is an upgraded version of the otherworldly intelligent MMI touch infotainment system. Also new to the S3 is Audi's killer customizable digital instrument cluster (shown) that marketing types like to call the "Virtual Cockpit." If you haven't heard of it (you missed our take on the all-new Audi allroad, huh? ), it’s basically a reconfigurable screen that can rotate between trip details, navigation, and your music. Given the complexity of its capabilities, it's remarkably easy to use. As an unexpected bonus, Virtual Cockpit negates the need for the center-mounted display screen -- which accomplishes most of the same tasks, but in lower resolution and more slowly. You can keep using it to mirror CarPlay, or lower it down into the dash entirely with the push of a button. You won't miss it -- the VC display quality is sharp, its processor speed is high, and its functionality is second to none. 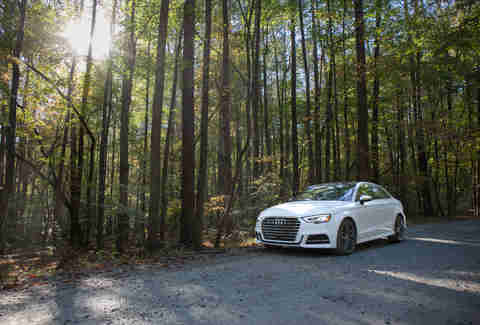 I turned to Audi's first-rate navigation system and pulled up the Google Maps satellite overlay, hoping to find some backroad trails where the S3 could come alive. The S3 doesn't exactly come with rally-ready tires, but when you're behind the wheel of one of Germany's finest sport sedans, a rough dirt road proves irresistible. The results were sublime. The dual-clutch automatic transmission is borderline sentient, popping off shifts almost instantaneously. Opting for the "Dynamic" package (a $1,500 option) adds magnetorheological dampers, which is engineering-speak for a suspension that perpetually adjusts itself to account for varying road conditions. A tap of the "ESC OFF" switch doesn't disengage traction control entirely, but enables much sportier settings and allows for more slip than usual. The setting is incredibly fun to use all the time. The S3 is so packed with technology, it's almost enough to make you wonder how Audi plans to outdo itself on its actual high-end products like the Q7 and R8. It's spacious enough inside to make you second-guess a larger sport sedan, like the S4. And it's more practical (but slightly more anonymous) than the TT family. Similarly, it's hard to make direct comparisons to other cars in the premium compact sport segment. The BMW M2 feels like an amped-up race car by comparison, with a price a few grand dearer. Next to an S3, the Mercedes-AMG CLA45 and GLA45 feel inadequate and unfinished. Comparisons to the Volkswagen GTI are misplaced -- the S3 clearly shares the GTI's ideals, but elevates them to a new level -- but the Golf R offers similar performance at a comparable price, if a hatchback interests you. Jeff Jablansky is a contributor to Thrillist Cars, and was raised in the city, where there were far fewer opportunities for tearing up the forest. Tread lightly with him @unclewithcars.